Premier Houseboats are pleased to present Sea Dragon, an ex oil rig lifeboat now cleverly converted to a houseboat, currently on the hard standing at Ramsgate marina, with the possibility of a mooring in the marina. Sea Dragon has been thoughtfully converted to maximise the space available whilst still retaining full cruising capabilities. The Front bedroom has a large triangle bed with king size quilt and under bed storage with space for units along the wall . The cockpit has two fixed vhf and one handheld vhf, one gps charging point, switch panel and an aluminium ladder which can be removed or put in place for cockpit access . The living room has a tv unit, wall mounted tv with ariel point, two double sockets, a large sofa , rug , and is fully carpeted . The kitchen has a microwave, kettle, toaster, new gas cooker and a 15 litre undersink water heater which is not connected. The shower room has full sized sink , mains connected mixer shower, mains connected mirror and linoleum flooring. The toilet room has a mini sink , 12v water tank connection and a full size toilet with 240v macerator. The 70hp Saab diesel engine is newly serviced, the boat also has grey and fresh water tanks. 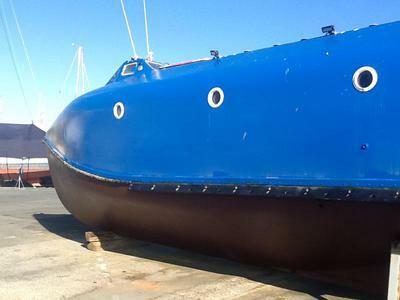 The hull has been anti fouled and has new anodes. Whether cruising or moored in a marina, Sea Dragon offers comfortable space for its size, and is a unique opportunity to enjoy life afloat, either full time or part time. Vessel name: Sea Dragon Vessel condition: Good Year constructed: 1997 Berths: 2 Cabins: 1 Heads: 1 No. of engines: 1 Engine model: Saab Engine power: 70 Fuel type: Diesel Length over all: 32' Beam: 10' Maximum draft: 3' Hull material: Glass Fibre Hull type: Other Disclaimer Premier Houseboats offers the details of this advert in good faith as it was presented by the seller or his representative but cannot guarantee or warrant the accuracy of this information nor warrant the condition of the described item within this advert. A buyer should instruct his agents, or his surveyors, to investigate such details as the buyer desires validated. The Item described within this advert is offered subject to prior sale, price change, or withdrawal without notice.